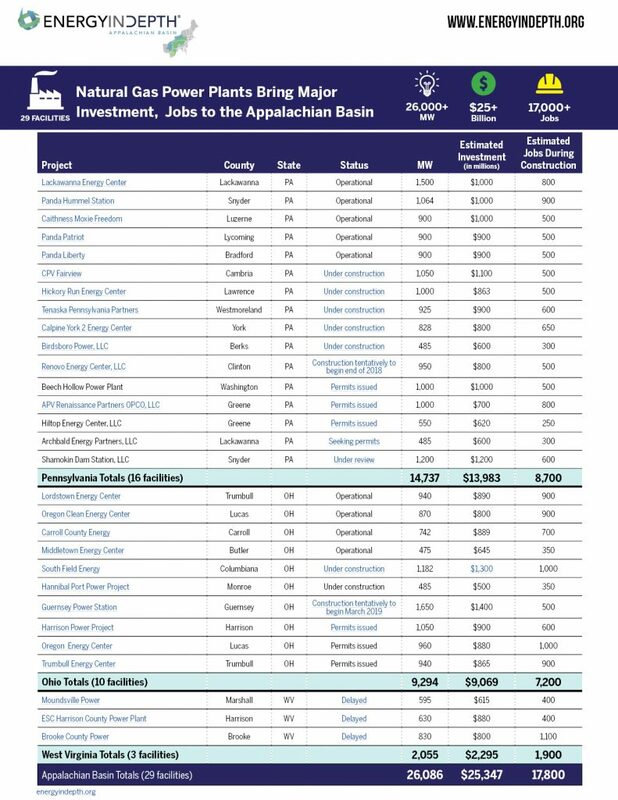 The Appalachian Basin is driving growth of record-shattering U.S. natural gas production, which in turn has helped spur more than $25 billion in natural gas electricity generation investment in the region. 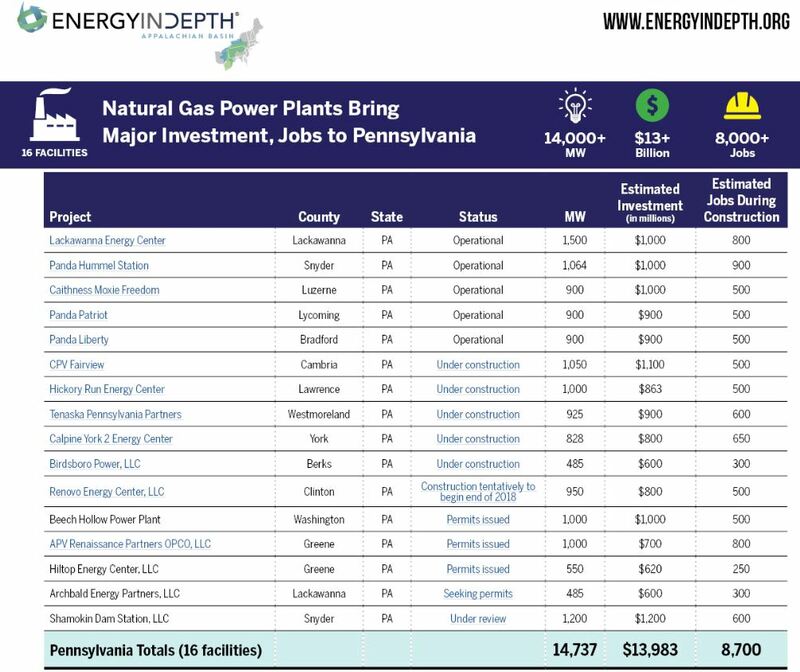 In fact, there are 29 new 475-megawatt (MW) or greater natural gas-fired power plants that are in various stages of permitting, under construction or have recently become operational in Ohio (10), Pennsylvania (16) and West Virginia (3), representing more than 26,000 MW of added electric capacity, more than 17,000 jobs during construction and incredible emissions reductions in the electricity sector. Further, these natural gas-fired power plant investments are increasingly important given the recent announcements of several coal and nuclear facilities that will be closing in the region over the next few years – coal currently represents 45 percent of Ohio’s electric mix and 93 percent of West Virginia’s, while nuclear energy is the leading fuel for electricity generation in Pennsylvania at 39 percent. There are 16 new power plant facilities in the works or recently completed in Pennsylvania that when operational will add nearly 15,000 MW of new electric capacity. These facilities, five of which have begun commercial operation since 2016, represent an estimated investment of nearly $14 billion and more than 8,000 jobs during construction. In 2005, natural gas provided less than five percent of Pennsylvania’s electricity generation. Today, natural gas represents about 36 percent of the state’s electric generation mix, with the power sector consuming roughly half of all natural gas used in the state, according to the U.S. Energy Information Administration. The transition to more natural gas facilities in the state is in no small part a result of the tremendous production of natural gas in the Commonwealth – nearly 5.5 trillion cubic feet in 2017. 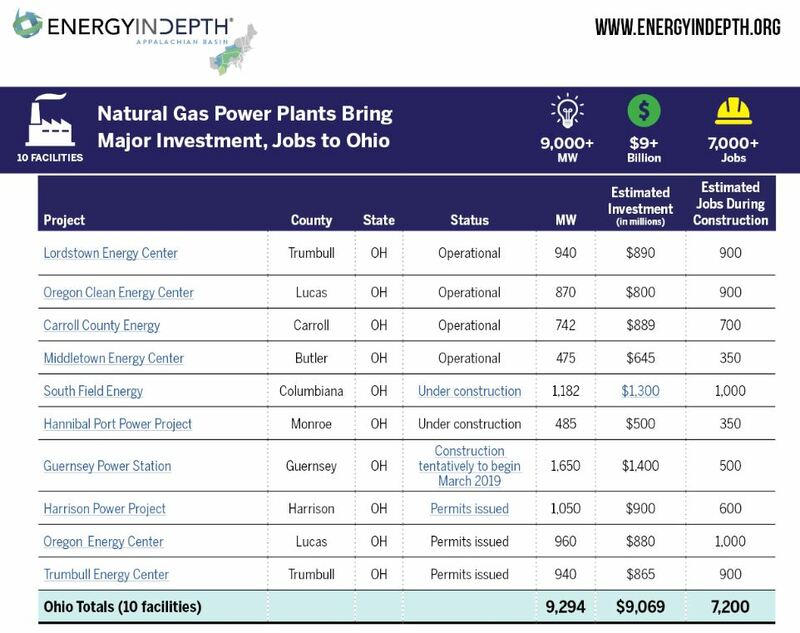 Ohio has 10 new natural gas-fired power plants in the works, four of which have already begun commercial operation. These facilities represent more than 9,000 MW of new electric capacity, an estimated investment of $9 billion and roughly 7,200 jobs during construction. The Appalachian Basin has seen some of the greatest greenhouse gas emissions reductions in the country thanks to the increased usage of natural gas. In fact, EIA data show Ohio actually led the nation in carbon dioxide emissions reductions by reducing its overall emissions by a whopping 57 million metric tons (MMT) and emissions from electricity generation by 50 MMT from 2005 to 2015. 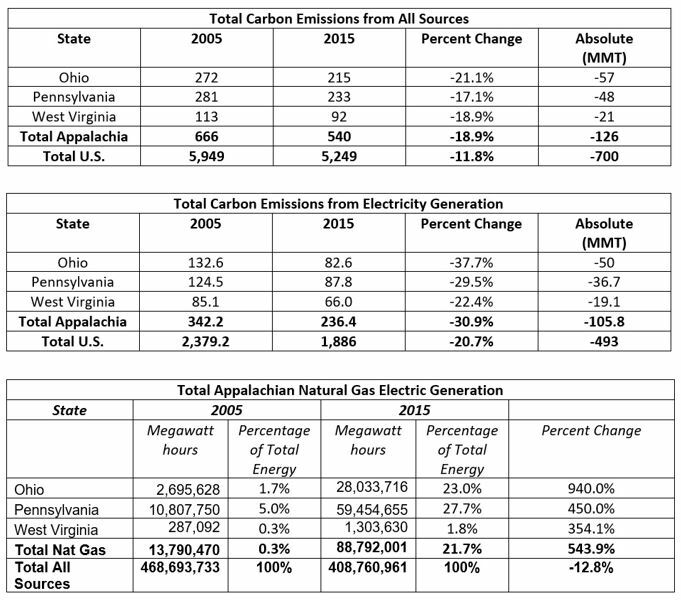 During that time period, the combined Appalachian Basin accounted for 18 percent of total U.S. carbon emissions reductions and 21.5 percent of total U.S. carbon emissions reductions for electricity generation, while the region’s natural gas-fired electricity generation increased from a mere 0.3 percent to nearly 22 percent. Similarly, a 2018 U.S. Environmental Protection Agency (EPA) air emissions trend report shows the region saw sulfur dioxide (SO2) emissions fall 72 percent from 2002 to 2014. These emissions reductions are incredibly important for the health of the Commonwealth, and they are occurring, at least in part, thanks to the increased use and production of natural gas in the region. All told, the increased interest in natural-gas fired power generation in the Appalachian Basin is providing incredible benefits for the region. These facilities provide jobs, economic stimulus and are helping to save consumers money by using an abundant, locally produced fuel source – for years to come.